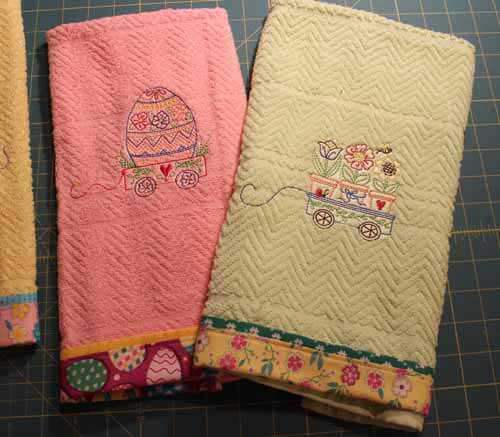 Learn how to put a pretty border on a store purchased towel with our video tutorial. I purchased these towels from Kohl's and machine embroidered designs on the towels. Now I will put a pretty border on the towel. It's very easy and you can use this to decorate any store purchased towels! 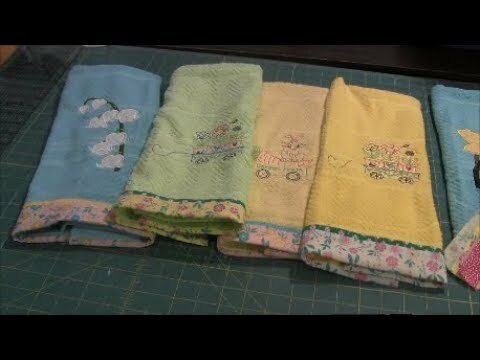 Click to watch the Learn how to add a Border to a Towel video in Youtube. 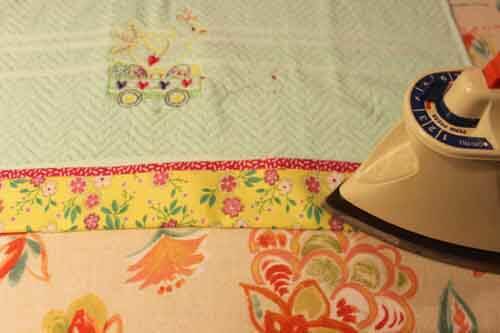 To add a border to the towel you will need two strips of fabric (see below for sizes). Pick out some pretty fabrics and add a border to your towels. These make great gifts! 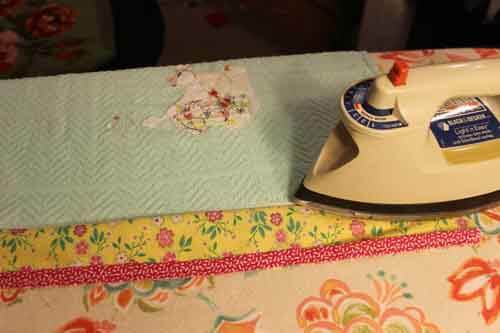 * One strip 1" wide x width of towel plus 2" - 3"
* One strip 2.5" wide x the width of the towel plus 2" - 3"
Step 1: Iron the 1" strip in half as shown. 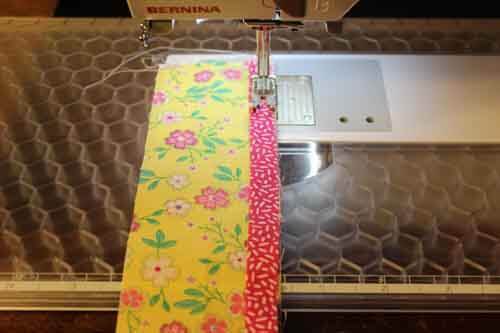 Step 2: Using a 1/4" seam, sew the folded strip onto the 2.5" strip. 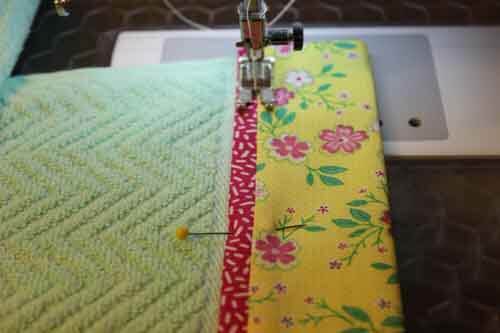 Place the 1" folded strip on top of the 2.5" lining up the raw edges and sew your 1/4" seam. Step 3: Next, take your sewn strips and sew to the towel. With the WRONG side of the towel facing up, place the strip RIGHT side DOWN (or with the wrong side also facing up). You are aligning the bottom edge of the towel with the raw edge of the strip. The part of the strip with the extra 1" strip should be away and NOT under the stitching. See photo. Step 4: At your iroining board, iron open the seam you stitched. 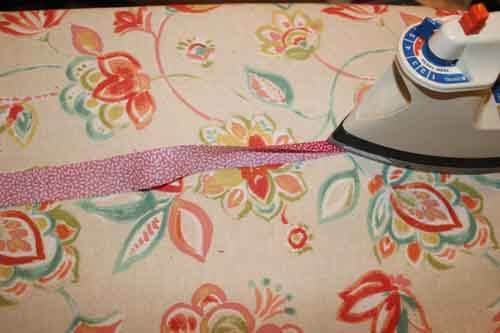 Step 5: Then iron open the seam where you stitched the 1" piece onto the strip. 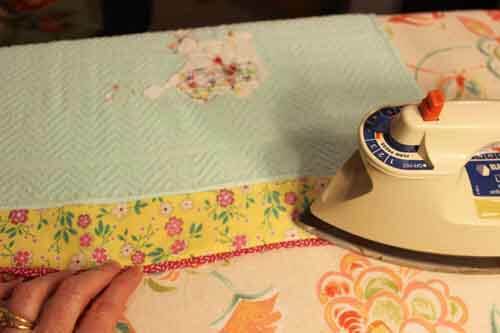 Step 6: Then fold the whole border up in the front of the towel and iron. Step 7: Next, open up the border again. 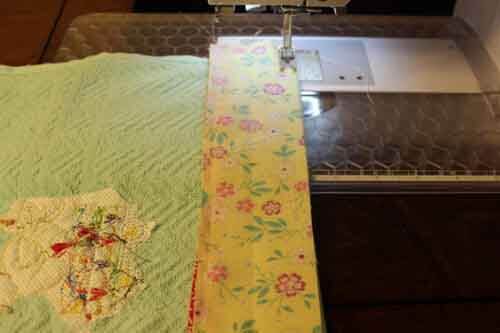 Fold the sides of the border fabric in. The folded edge should align with the side of the towel. Also, fold in the corner to tuck in the raw edge. We don't want the raw edge to show. 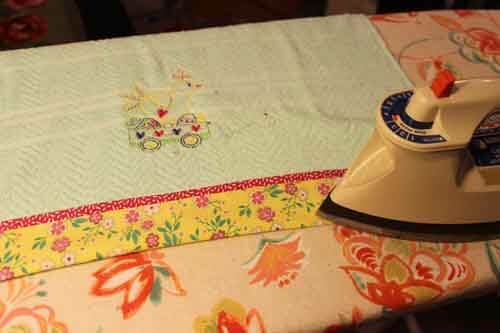 Step 8: Fold the border back up into place and iron. 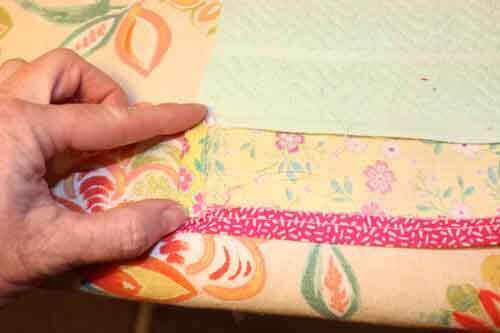 Pin the sides and along the top edge of the border to hold in place. 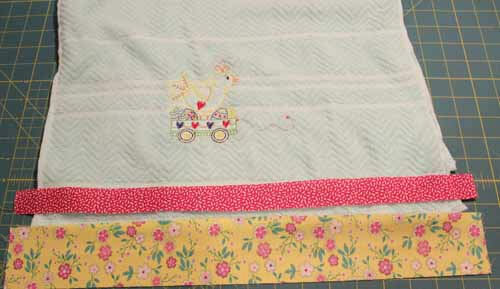 Step 9: Sew the border in place by sewing along the seam between the two borders using the "Stitch in the Ditch" method. Also, sew along the sides of the borders. (I found after washing that if I didn't sew the sides down, the sides pop out and fray!) 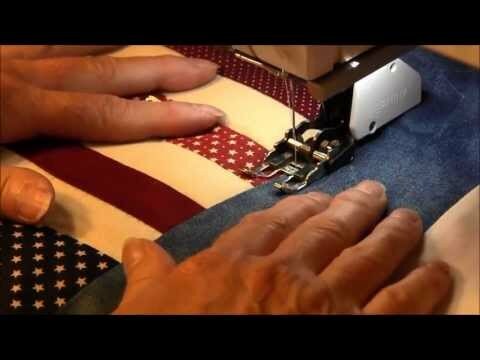 If you don't know stitch in the ditch, click the photo below for a video tutorial. Your towel border is complete! We hope you enjoyed this video and photo tutorial. 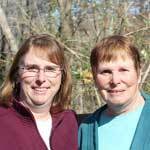 Check below for some links to sites to purchase supplies for this project. By purchasing through our links, we receive a small commission on the sale and you help us to keep making more videos and tutorials. 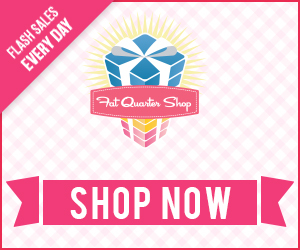 Thank you for your puchase!